If you are travelling without a car, or prefer not to use your vehicle during your holiday, you will also be within easy walking distance of all important places such as the jetty, restaurants, ice cream parlor or supermarket. And what can be more beautiful than to escape everyday life and just feel the fresh breeze! But, of course, this doesn´t mean that you must walk everywhere: the regional bus services of Oberbayern, which has a bus stop in Gstadt, commutes to the entire region and to the most beautiful sight-seeing destinations. 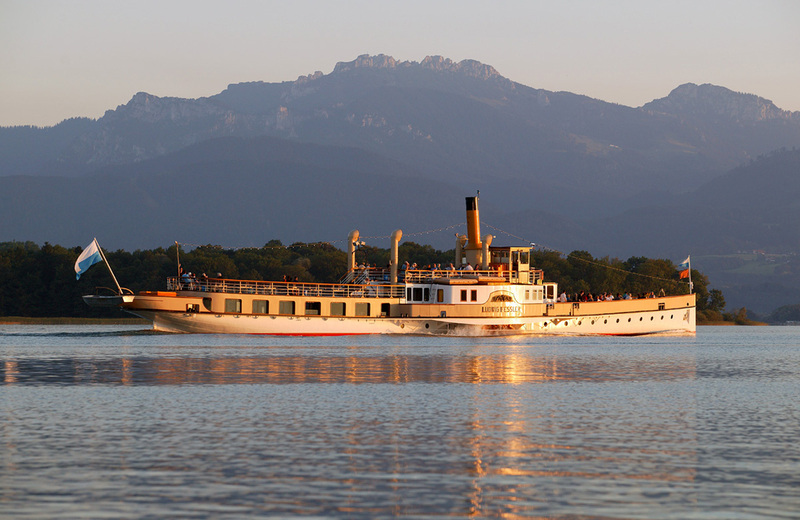 In addition, during the summer months, there is the “Chiemsee Ring Bus” line, which circumnavigates the lake and is ideal for combined hiking and biking tours. Use your Guest Card to travel for free. 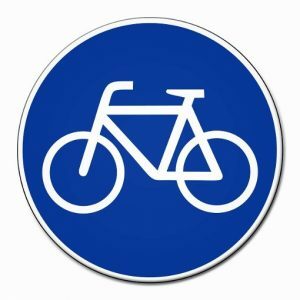 Fees apply for bicyle transport. Cycling in the nature? You can also rent bikes and e-bikes during your stay in Gstadt. For a cultural experience, go on a sightseeing tour or visit a city: the Deutsche Bahn’s Bavarian Ticket is a quick and cheap transport alternative for groups or single travelers, to Salzburg, Munich, Rosenheim, Kufstein or Wasserburg am Inn. Contact us, we will happily advise you on a car-free holiday in Gstadt at Lake Chiemsee! Ships go directly from Gstadt to the island of Fraueninsel and from there to the other ports including the island of Herreninsel. There are also other connections from Prien/Stock and round trips on the lake. In Prien itself you can take the “Chiemseebahn” (a historic steam train called „Bockerl“) from the port into the town center and back. 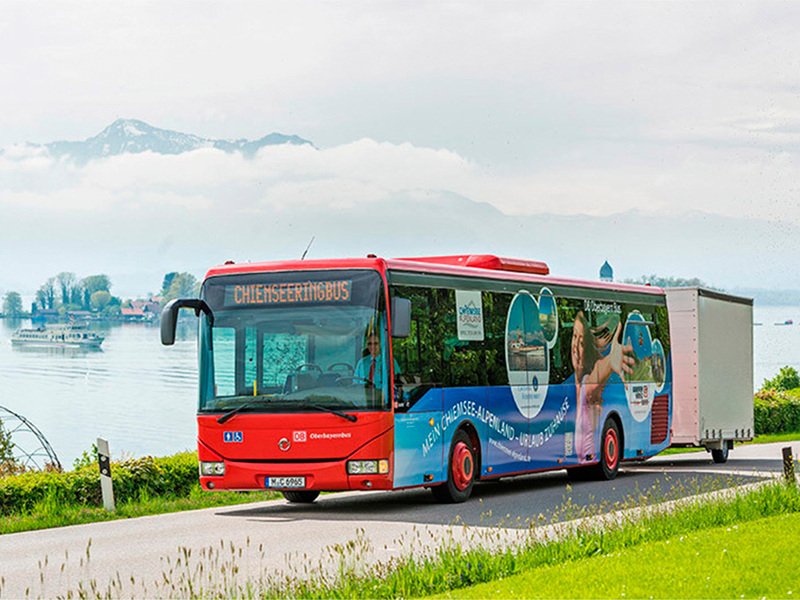 Guests with a valid Gstadt guest card can travel free of charge on the buses of the Chiemsee Ring Line. Transporting a bike costs 2.10 € per bicycle. Reduced rates for locals. From Prien train station you can take the Chiemgau train to Aschau i. Ch. With the RVO line 9505 from Prien you can reach the villages of Rottau, Grassau, Marquartstein, Unterwössen, Oberwössen and Reit im Winkl. The nearest railway stations are in Prien am Chiemsee or Bad Endorf where the MERIDIAN stops every hour and takes you to both Munich and Salzburg. There are also connections to the Chiemsee Ring Line and to various local buses. This bus runs daily from Monday to Friday from April to October, and Monday, Wednesday and Friday from November to March. If travelling between two municipalities, the trip costs 1 Euro for adults and 0,50 Euro for children. Travelling through three or more communities, costs 1.50 Euros for adults and 0.80 Euros for children. Voluntary drivers make the citizen bus possible and transport up to eight persons in the small buses. With the RVO line 9520 you reach the towns of Prien, Chieming, Seebruck, Rimsting and Traunstein. Our local bus company offers interesting day trips. accessible Year round ferry services, toilet is available in the tourist office. accessible Bicycle rental with 2-seater bikes and a wheelchair-bicycle.